Mike Hammer deliver’s on the comedy and doubles down on the magic. With a heavy slight-of-hand offering and dashing dose of showmanship that Vegas audiences have come to adore, find yourself and this great show offering that is both fun and entertaining. His prankish mind-reading skills catch up to the mayhem he likes to cause at his residency in Downtown Las Vegas, the currently trendy neighborhood known as Fremont Street that’s packed with plenty of options for entertainment. His energy and improv chops are biting and refreshingly original, not to mention… how cool is it when a man can swallow a sword? With lots of humor and dazzling card tricks that keep the family guessing, Mike Hammer Comedy Magic Show is a great choice that everyone can enjoy. 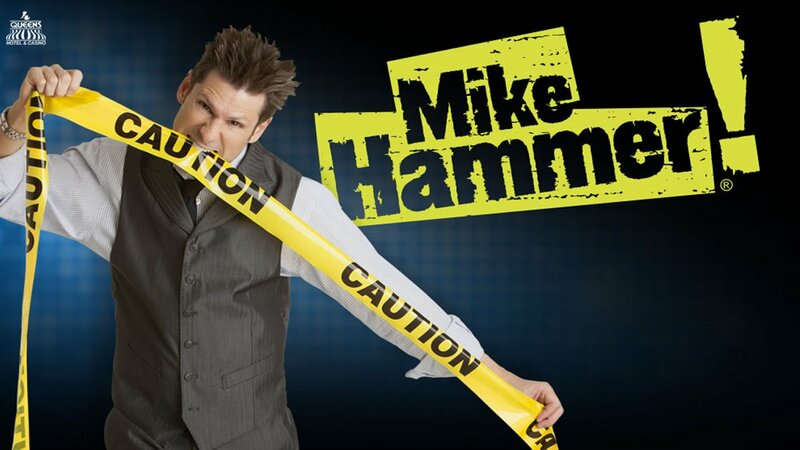 From escaping put of handcuffs to the acts of juggling and spinning random objects in the air at very fast speeds, Mike Hammer keeps the show moving at a break-neck pace that keeps the audience thoroughly entertained. His easy-going nature brings the along for a wild ride at every step of the way during his gags and tricks. On top of it all, afterward the show, he hangs out so feel free to stay hi and grab a photo with this local celebrity. He’s a real crowd-pleaser.